A very welcome return to artdroid Lee Garbett who has produced this cracking cover to prog 1762, featuring a rather scary Maggie Roth about to crack some heads! 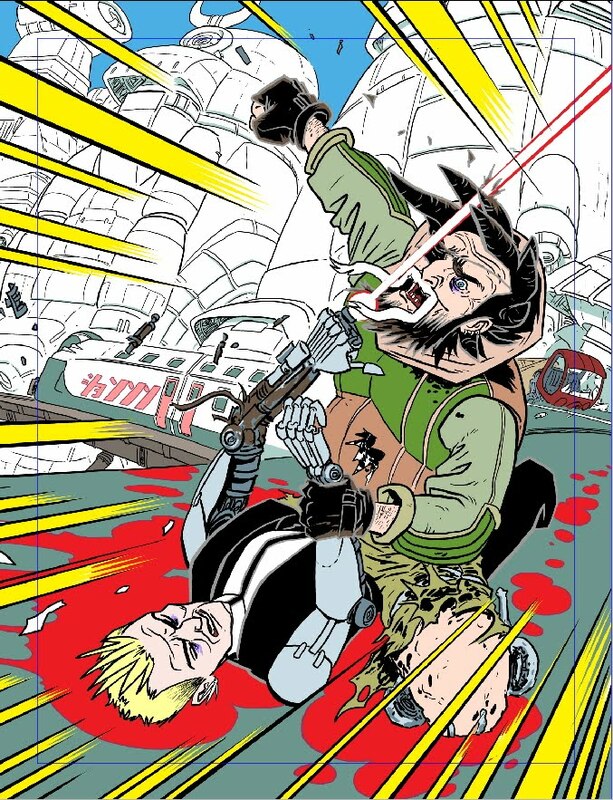 Lee was last seen in the Galaxy's greatest in 2006 where he provided brilliant art on the fantastic story London Falling, by Si Spurrier. This gruesome, self contained tale was a horror story exploring a range of monsters from folklore and the power of belief. Lee provided wonderful art which saw numerous mythical beasties rampaging around London committing a range of atrocities, the highlights including the horrific murder of the Queen as well as carnage at the Oxford and Cambridge Boat Race. 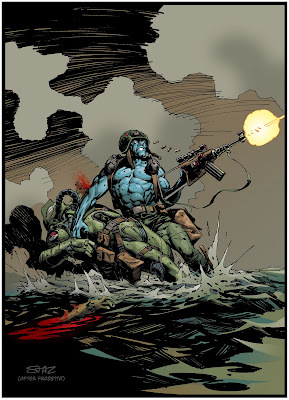 True 2000AD subversion! 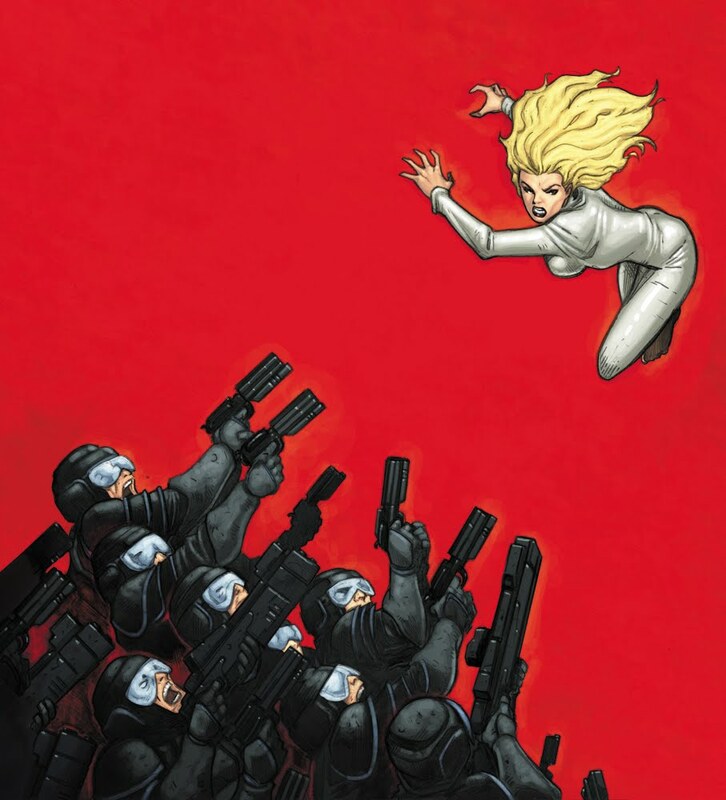 Since then, Lee has gone on to big things, providing many covers for publishers such as DC and working high profile storiessuch as 'The Return of Bruce Wayne' and the relaunch of Batgirl. Next up are the pencils, over at his blog, Lee says "Once we had the idea down I set about the finished drawing. I decided to let Angel hang in space a little more in the final piece.."
Lee was pleased with the final result, praising 2000AD's brilliant design team. 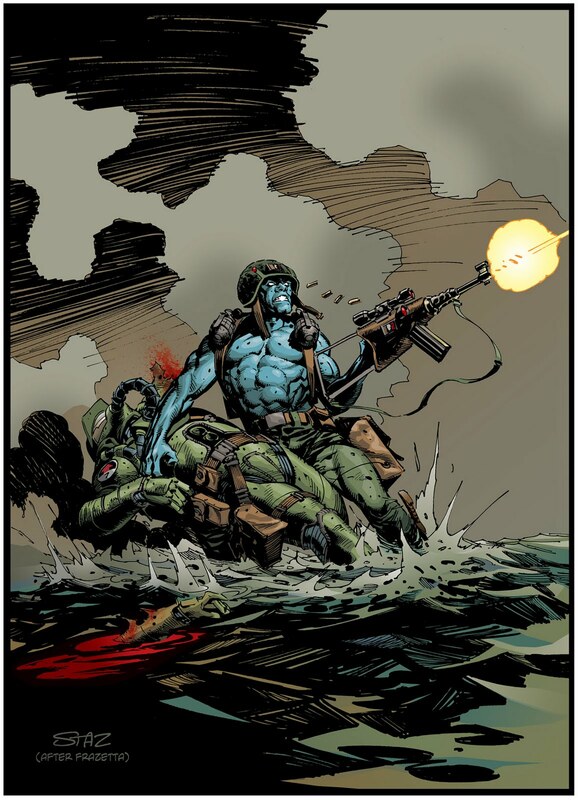 he says "Matt and the designers at 2000AD did a great job of recognising and maintaining the negative space. A lot of folks get fearful of that and try to fill it with words or ask to add another character etc which can destroy the balance but here it's allowed to breathe..."
And finally this brilliantly moody Dredd which I've always loved! Dirty Frank - Trained to kill! 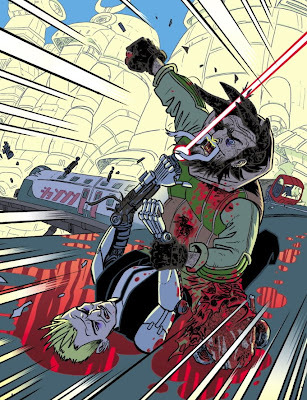 An absolutely explosive cover to mark the end of (hopefully) the current series of Low Life. Dirty Frank and Dirty Judge Aimee Nixon, slug it out atop a high speed train in Hondo City, could you ask for more? The cover is, of course, by bona fide artistic genius D'Israeli who has been kind enough to send a brilliantly detailed master-class of his creative process as well as links to some freeby files! 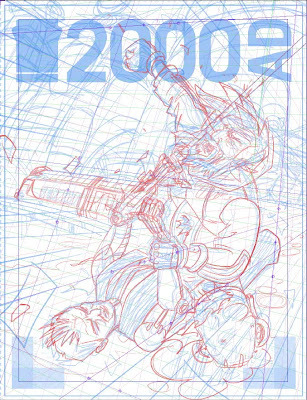 Matt begins "Once I started sketching out the design I made one small tweak which was to have Amy’s gun firing close by Frank’s head - I thought that without that sense of immediate threat to Frank’s life, the image of a big, hairy guy holding down and about to punch a woman would have looked a bit dodgy!" Ha ha, I see what you mean! Below we see Matt's rough sketch Matt's first sketch to get an idea of how the cover will look: "First try at the composition. I actually think this is a better drawing than the one I went with, but the figures don’t fill the frame as well. 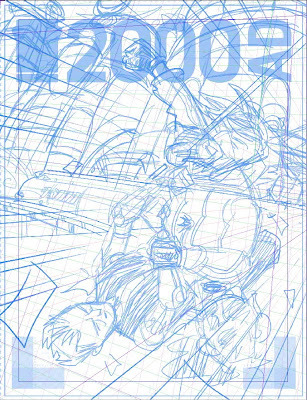 By moving around to the right and getting a bit lower, the figures fill the frame better, and I think there’s a bit more sense of impact..."
"I’d built a template file in Manga Studio for the previous Lowlife cover - this contains various drawing layers with colour options set as I want them (Manga Studio can be set so you can only draw with one colour per layer - I use colour coding for the different stages of the drawing). The template also has 2000AD’s own cover guide embedded, so I know how much space will be taken up by the logo and barcodes. 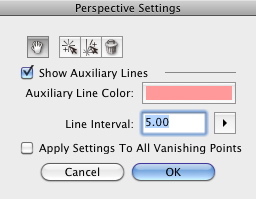 I use Manga Studio’s perspective rulers to set up a three-point perspective grid (on a perspective ruler layer, right-click any vanishing point with the Object Selector Tool (fig 2a) which gives you a dialog box with controls for colour and number of lines that radiate from that vanishing point (fig 2b). Manga Studio famously has Perspective Rulers that force you to draw straight lines in perspective, but here I’m drawing curvy Dredd-world architecture, so I just want to know where the perspective lines run so I can draw curves around them. I draw in rough “skeletons” for the figures and a quick indication of where the train’s going to go. At this stage getting the figures the right size, in the right place and the right pose is the main thing." Next onto Matt's rough pencils, he continues "At this point I’m blocking in the figures and the background (this is what I’ll send to Matt Smith for approval). 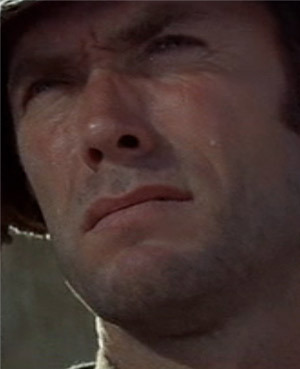 I’m thinking in broad terms here - for example, Frank’s face is a bit crude, but I’ll fix that at the next stage." 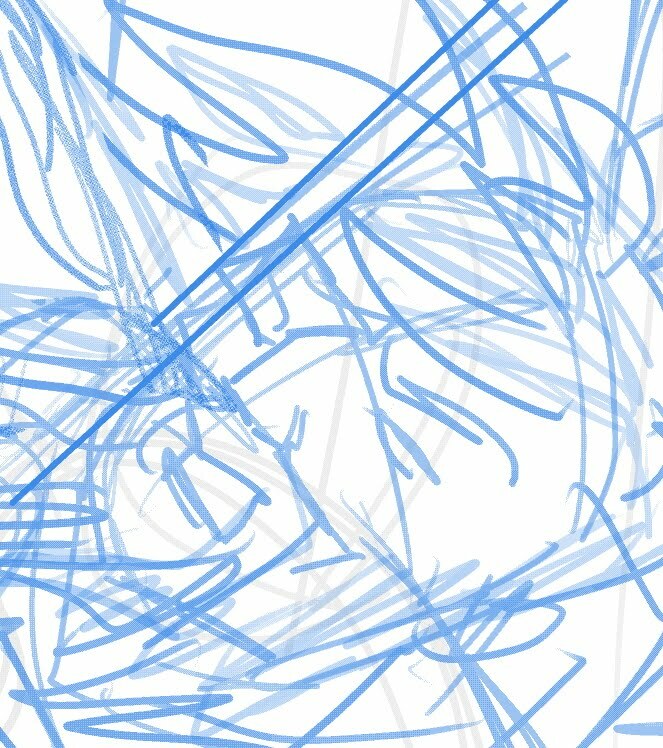 "One of the problems of drawing with a Wacom tablet is it’s easy to lose track of what scale you’re working at, and end up fiddling around with details so tiny they’ll barely print. 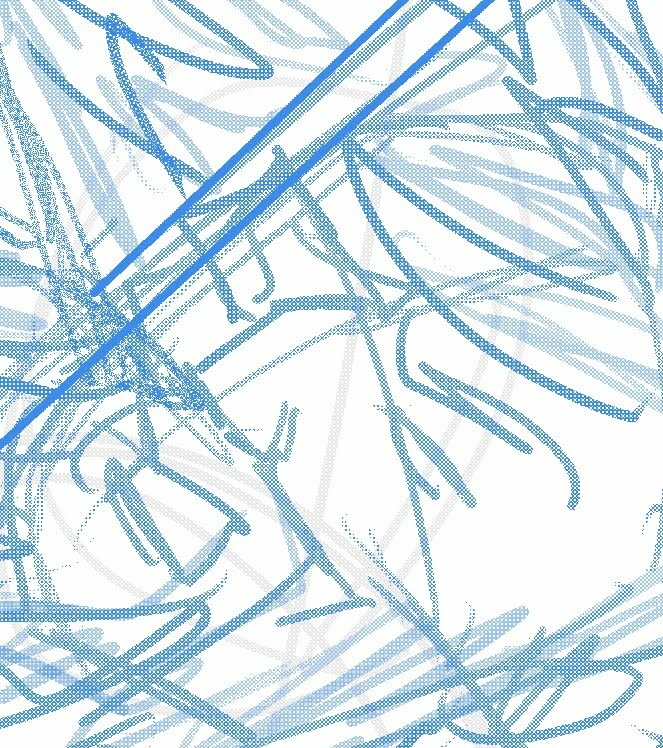 Though I dislike drawing with real pencils (one of my reasons for switching to digital was so I could draw from the start with truly erasable pen), I’ve started using Manga Studio’s Pencil Tool for roughing and pencilling, because the lines break up into dot patterns if I enlarge too much (fig 3a shows maximum scale at which lines display normally, fig 3b shows lines breaking up into dots, signalling you’re working at too large a scale.) This feature literally helps me keep things in proportion!" 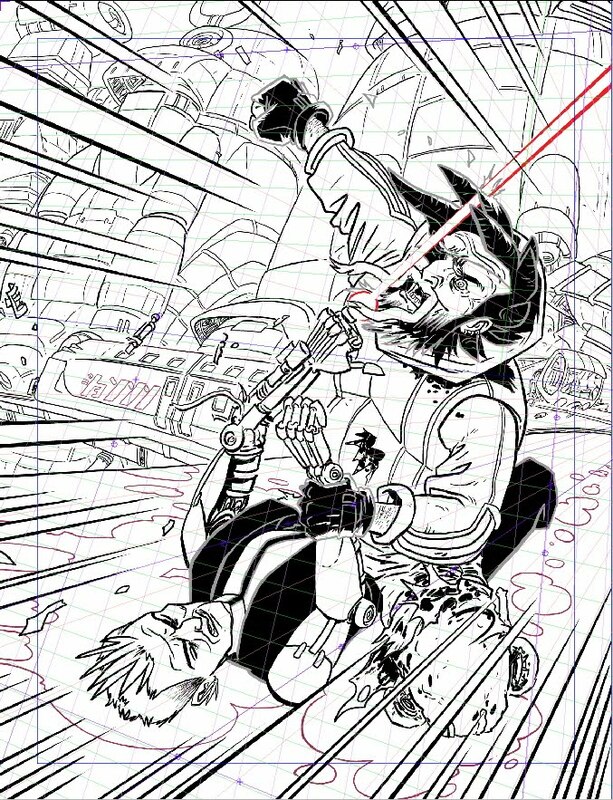 "One place I have used Manga Studio’s Perspective Rulers is for the “speed” lines around the edges of the frame." Fig 3b - Lines breaking up. Time to tighten up those pencils, "Here I’m tidying up the figures and adding more detail. 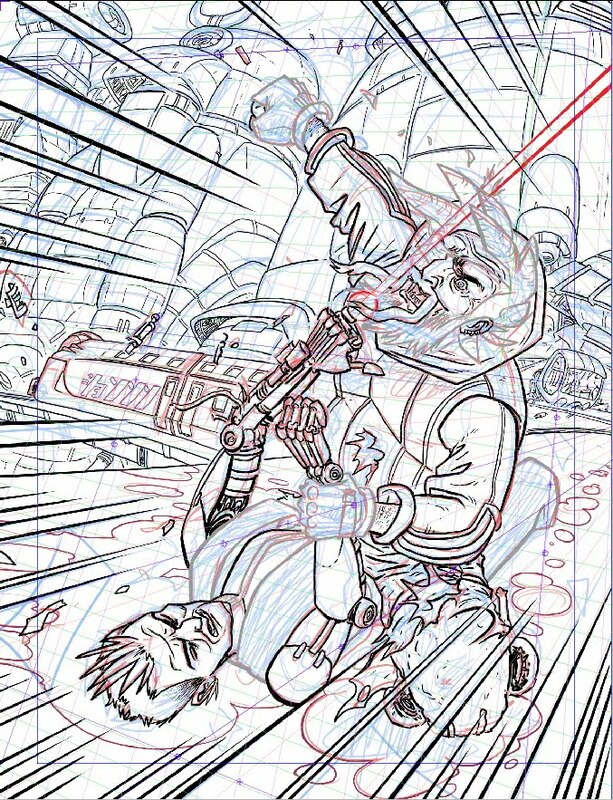 I don’t usually bother fine-tuning backgrounds, since with digital it’s easy to erase and correct drawing done at the inking stage..."
"Next we see my inked outlines over pencils. I use five or six layers for my inks, separating out foreground from background and allowing me to isolate the grey outlines of Aimee’s suit, which I’ll want to convert to colour at some point." 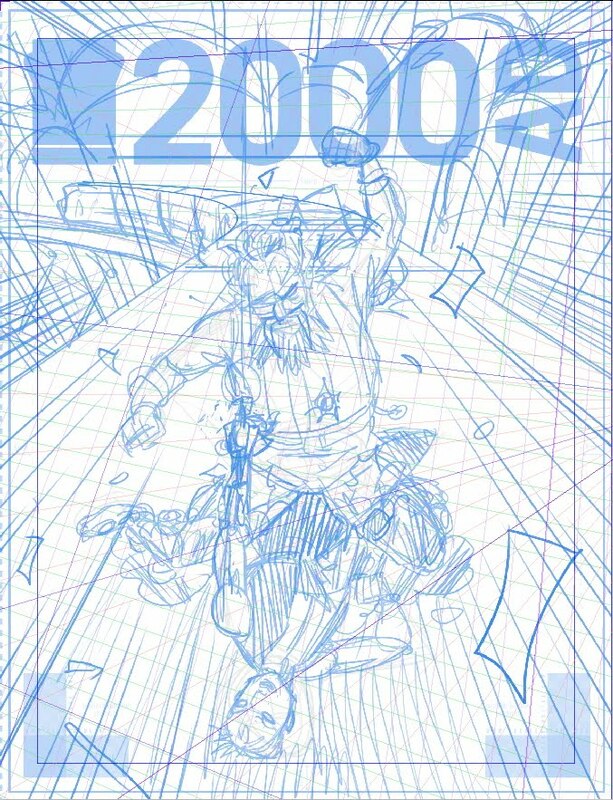 As D'Israeli continues to ink, the image really begins to take shape. 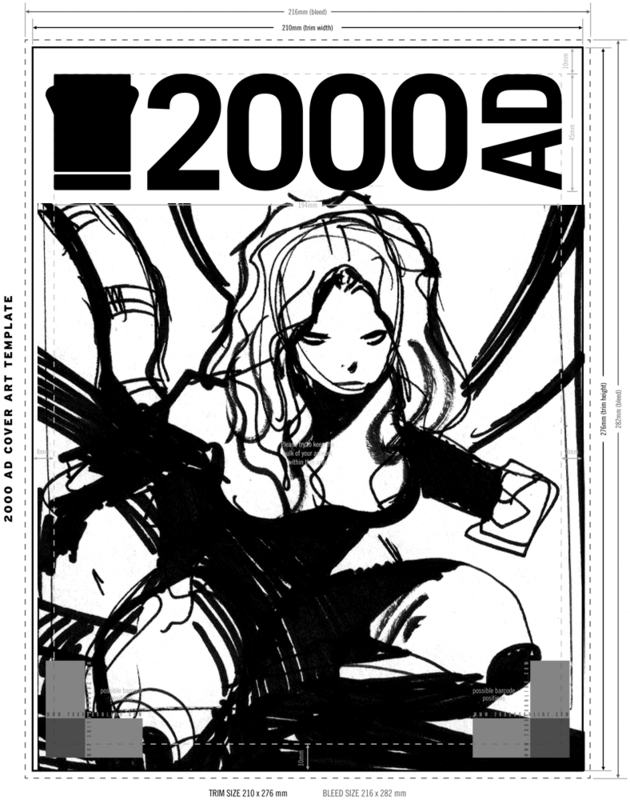 "Here are the inks with blacks - the blacks again are on their own set of layers - this lets me separate the black of Aimee’s suit (which will stay solid black) from the black of Frank’s hair (which will be filled with texture.)" Below, we see D'Israeli begin to add his “Flats” - "On a layer below all the others I start filling the different parts of the drawing with flat colour. I use Manga Studio’s Paint Bucket Tool for this - like Photoshop’s Paint Bucket, it can use lines from other layers to constrain the fills, but also it can be set to ignore small gaps, much reducing the constant “flooding” you get with the Paint Bucket in Photoshop. It can also be set to automatically expand the fill a set number of pixels under the surrounding outlines. Since I started using Manga Studio, I’ve switched over to doing all my basic “flatting” in that program. 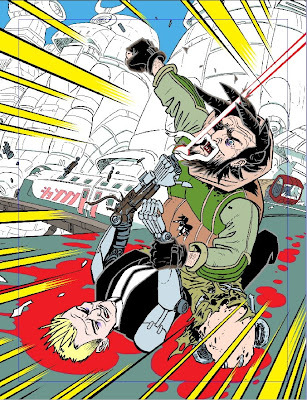 It’s startlingly faster than using Photoshop, and I’d recommend anyone doing a lot of colouring to try it. Photoshop is still much better for the more sophisticated stuff, though..."
Next the artist begins to add some of the yucky details "I've added bloodstains and reflections to the pool of blood under the figures. 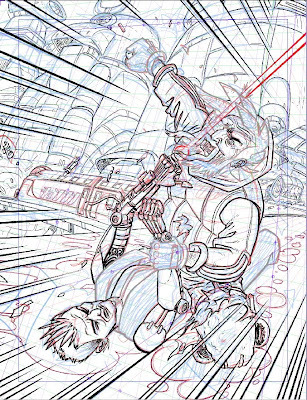 As well as the colouring, I add two layers that I’ll process later in Photoshop (for clarity, I’ve hidden the colouring in the following examples, but it’s still there)"
Onto shading - "I know I want the foreground figures to be in shadow (so the muzzle flash from Aimee’s gun will look more dramatic.) On a new layer, I fill the areas I want shaded in grey. I’ll change this later in Photoshop." This leads us nicely to some of Matt's exquisite texture work as he begins to work on a layer of 'Grot!' - "Grot - Frank’s face and hands are meant to be permanently grimy. On a new layer I add fills to the areas I’ll want to have the “grot” texture. Again, this awaits more work in Photoshop." Phew, with all the preliminary work done, it's time to change programs "WITH ALL LAYERS MADE VISIBLE, I EXPORT THE FILE FROM MANGA STUDIO IN PHOTOSHOP FORMAT." 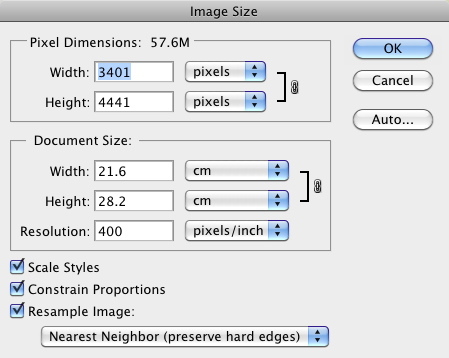 "Manga Studio can export at various sizes and resolutions but the best method I’ve found is to export at 600dpi (giving best quality from the Manga Studio file) and then reducing to a more manageable 400dpi using Photoshop’s Image Size function with “Resample Image” set to “Nearest Neighbour (preserve hard edges)". 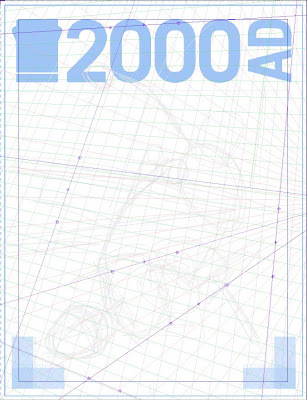 400dpi is the lowest resolution where the image will print smoothly without the image pixels being visible as little “steps” on hard edges. At lower resolutions you can use a slight blurring (anti-aliasing) to hide the stepping, but it makes making selections and fills a bit more fiddly..."
Back to adding Grot - "In Photoshop, I go to the layer containing the blue “grot” mask. 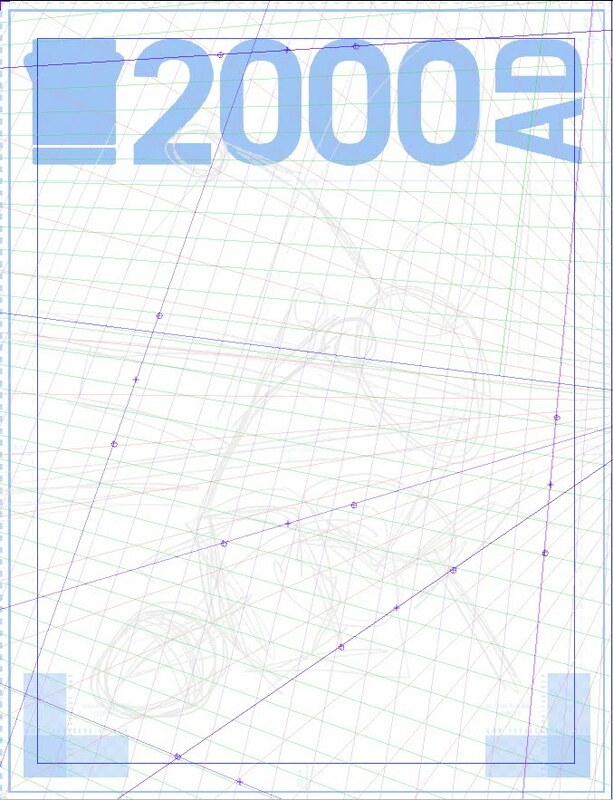 I Lock Transparency for that layer, fill the blue areas with white (Edit: Fill) and then set the Layer Blend Mode to Multiply, which makes the white fill transparent. Since locking transparency means I can only work on areas of that layer that have been filled, I can now dab texture onto Frank’s face and hands (using a texture brush of my own making) and the texture will only appear in the areas I defined." "On the layer containing the black of Frank’s hair, I again Lock Transparancy and set the Blend Mode to Multiply. Using the Paint Bucket Tool (with the “Anti-Alias”, “Contiguous” and “All Layers” check boxes all unchecked), I fill the blacks in one go with a texture I made previously (by picking “Pattern” from the “Foreground” pull-down menu in the upper menu bar.)" Matt has very kindly shared some of his textures "If you want to try some of my texture fills, you can download a set from http://dl.dropbox.com/u/1357329/04-04-09%20Lowlife%20Grot%20Textures.pat . The patterns should be compatible with CS3 or later (it’s worth trying if you have an earlier version of Photoshop). For help in loading the patterns, run Photoshop Help and type “Manage pattern libraries and presets” into the search bar." "Shading - I went to the layer I’d set up as a shading mask (four pictures up - Pete,) and, you guessed it, Locked Transparency, set Blend Mode to Multiply, and used Edit: Fill to fill the shaded area with a light blue-grey (it’s the colour of the body of the train in the background). Setting Blend Mode to Multiply means that everything under the blue shadow is tinted as if I’d put a watercolour wash over it." 1) Make sure you’re on the layer with the shading. 3) A dialog box will appear with two pull down menus. The top one will have the name of the current document. Leave that alone. The bottom one should say “(name of layer you’re on) Transparency” (if it doesn’t, pull down the pull-down list and pick it). Click OK.
4) All the shadow-stuff will be selected. Go Select: Select Inverse and now everything that’s not shadow-stuff is selected. 5) Make a new layer and pick the colour of your choice (in this case, a nice light yellow) from the Photoshop Swatches. This method looks a bit complicated, but it has the advantage that you can make a “counter-fill” of things containing gradations or soft edges in a way that just won’t work with the Paint Bucket or Magic Wand tools." "Modelling - at this point I make a couple of new layers below the outlines but above the colours - one will be for shading, and is set to Blend Mode: Multiply so the contents will darken what’s below them like a wash. Another has Blend Mode: Normal but Opacity set to 50% to give me highlights (like using semi-opaque acrylic paint.)" 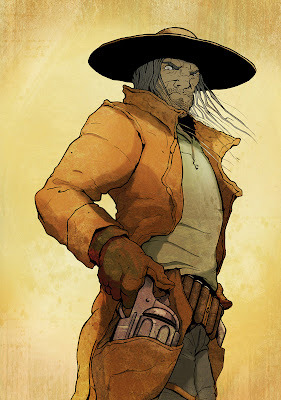 "I dislike the very soft shading often produced with Photoshop, so I use either the Pencil Tool or the Lasso Tool (plus Edit: Fill) to draw in my highlight and shadow areas. I use the same grey-blue as before for shading. Highlights are either the pale yellow from the background (for highlights coming from the right) or a pale blue (reflected light from the sky) coming from the left. That extra pale blue helps both to define the shapes of the figures and to “pop” them forward from the background. I also add some gradations to the roof of the train and the blood puddle under the figures (to select small areas of fiddly colour, try drawing round them with the Lasso Tool then using Select: Colour Range…)"
"I don’t want all my shadows and highlights to be entirely hard-edged, so I use an adapted Photoshop brush to soften some of the edges. 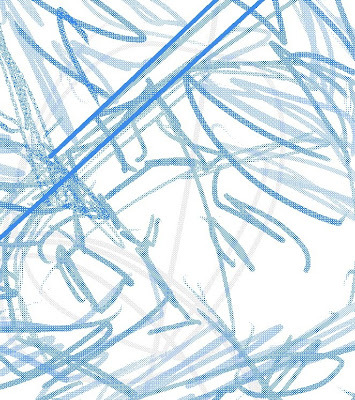 This brush is quite hard-edged, but pressure sensitive, and leaves an effect a bit like brush strokes. I have a set of Photoshop brushes available for download here: http://dl.dropbox.com/u/1357329/04-04-09%20Matt%20Tool%20Presets.tpl - to load them, run Photoshop Help and enter “Load, save, and manage brush presets” into the search bar. Once loaded, the brushes will appear in a pull-down list at the top-left of the screen when you have the Brush Tool selected. The ones I’ve mentioned here are called “Brush Tool Hard Round (size)” and come in several sizes." 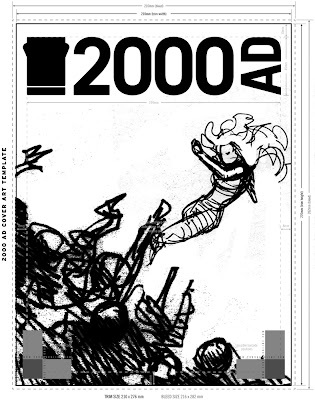 The very final stage is conversion to CMYK mode and flattening to TIFF format before sending to 2000AD via FTP." Simply, simply stunning! It's humbling to see a real draughtsman at work and a privilege to be able to share his talent with you. Thanks so much to Matt for being so kind with his time and for those brilliant free resources. Please remember to visit his fantatically informative blog here for more pearls of wisdom and really in depth articles on the creative process. Chris Weston - Talented Bugger! 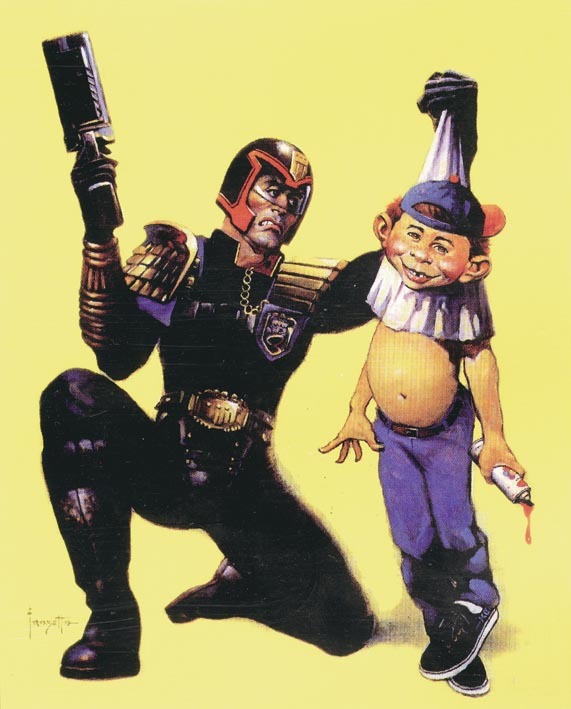 Well, it looks like Indigo Prime's seamsters have been tinkering with time again; this time they've plucked their own artist from twenty years ago and made him paint this amazingly gross cover! Yup, veteran artdroid Chris Weston has returned to produce this gloriously nasty image for the current Indigo Prime tale, 'Anthropocalypse'. 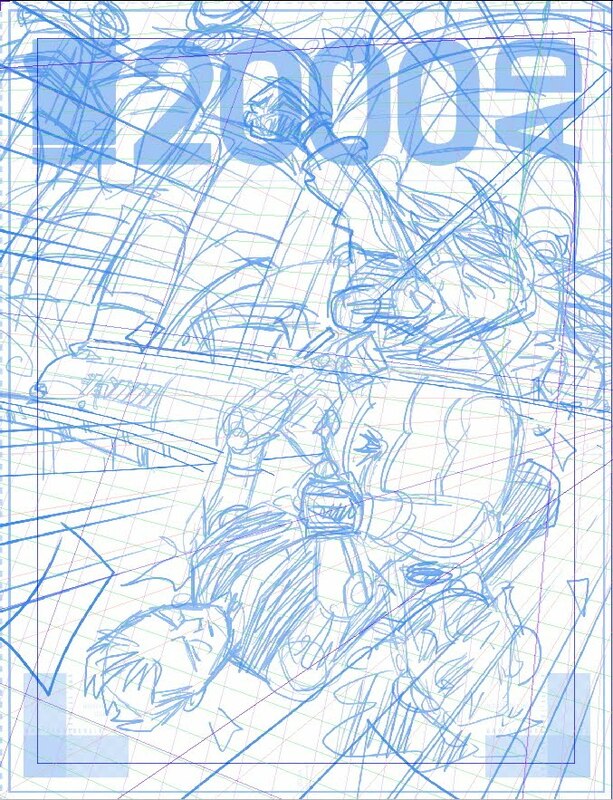 Below we see Chris' bonkersly detailed 'rough' (rough, blimey!?!) ?It features Indigo Prime agent Spacesick Steve, who is trapped in a diseased reality where Earth is being overrun by giant creepy crawlies - ugh! 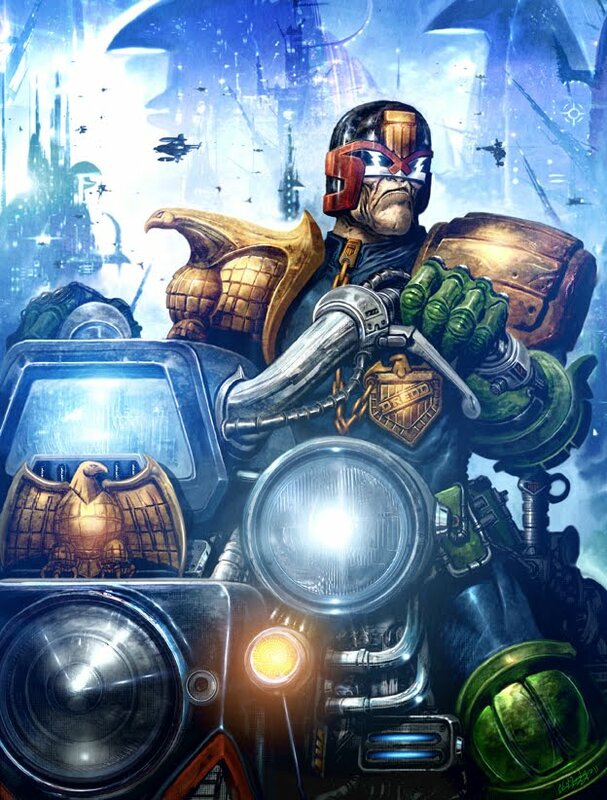 In my opinion, this cover is bursting with pure, old skool 2000AD Thrillpower! It completely captures the magic of those early 'Supercovers' by the likes of Bolland, Lopez and Ferrer which would often featured poor Earthlings at the mercy of horrific giant beasties. Stunning work. EDIT - I asked Chris about this and he said "That was EXACTLY what I was going for. That thought genuinely crossed my mind. I just wish i could have given the little boy the following superfluous speech bubble : "Kill me, mummy, before the insects eat my guts!" Quick, someone Photoshop one on! Thanks to Chris for sending the images - remember to visit his brilliant website here and his wonderful blog here. 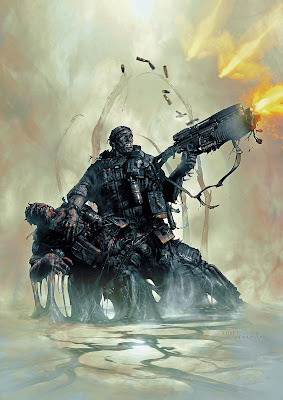 Mark Harrison is Rebellion's head concept designer and maaaan, does it show! Every aspect of every cover he does is considered to the nth degree and absolutely packed with research and revisions. 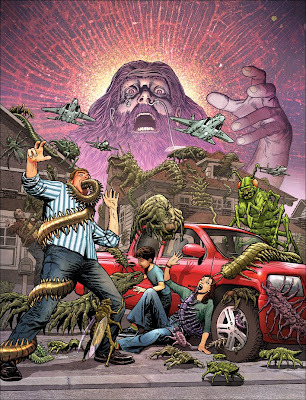 This brilliant cover to Megazine 317 is no different, as you'll discover as you read on. 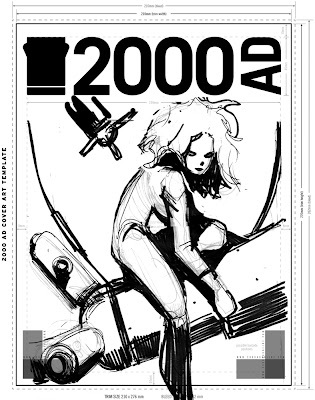 When I contacted Mark, I congratulated him on having a Meg cover with the most cringe-worthy tag line in 2000AD's long history. Resyk-Hell was the offending tag line (Recycle, geddit?) and Mark proudly told me that he was responsible for that stinker! For shame! I also asked Mark about his change of style here. I pride myself on being able to identify an artist's work on sight but this cover threw me. Mark said "A lot of the image was based on photo imagery, specifically the Judge Minty fan stuff. 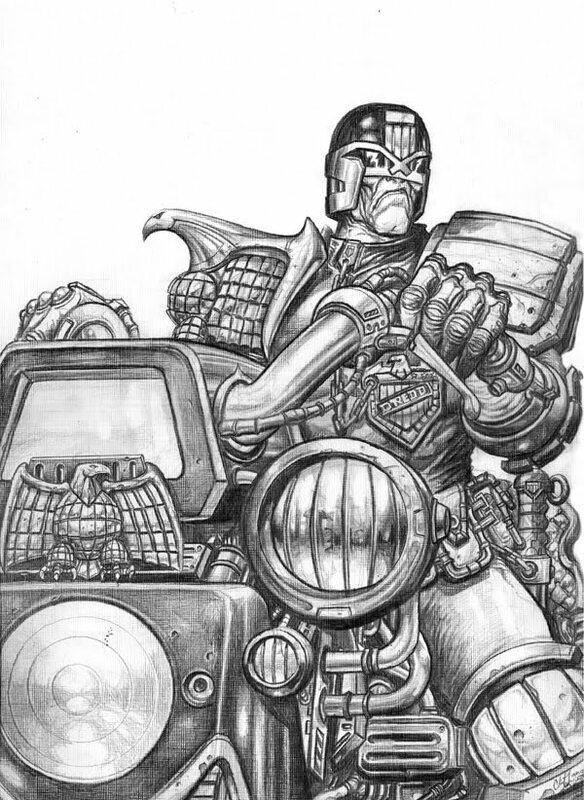 At one point I was digitally painting up Greg Staples as Dredd, artist painting a fellow artist as a comic character in a costume created by fans....!" Cool! Check out the Judge Minty site here to see more! Mark takes us through the creative process - "It's pretty tough to come up with a new Dredd pose that's also cool, but it's probably going to be the execution that will mark it out as different. 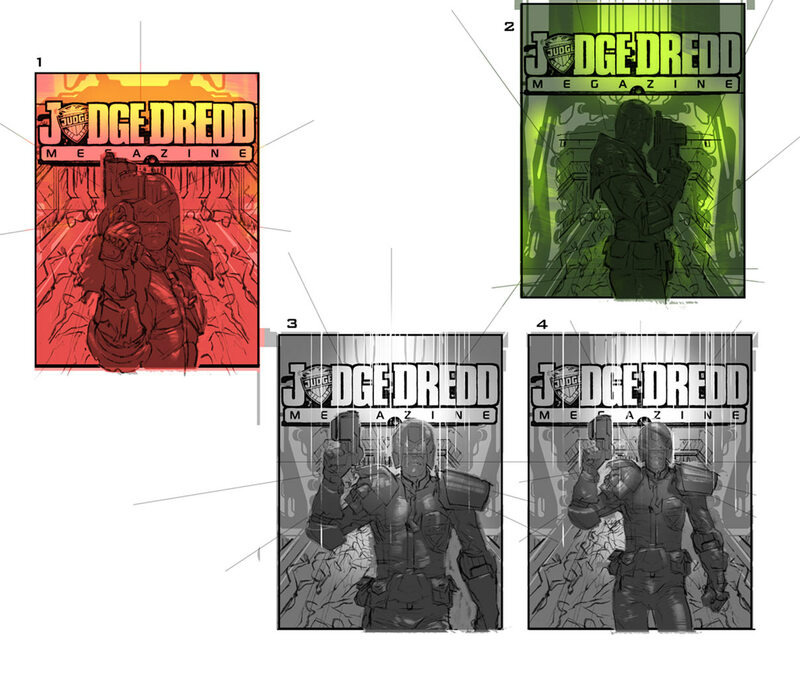 So with that in mind, take a look at these 4 dredd poses, and take account of the second sheet (no colour) that has some additional ideas." 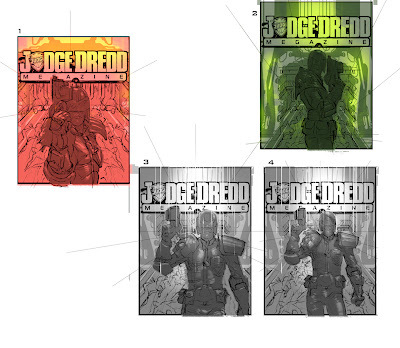 Tharg was happy with the initial ideas, saying "Thanks for the cover sketches. 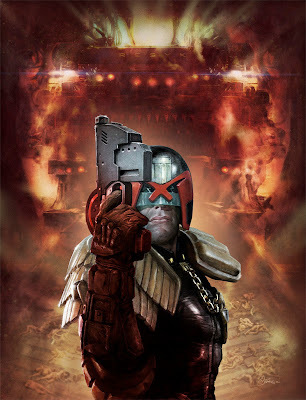 I like no 1 the best in terms of Dredd’s pose, and I like the reddy orange colour scheme..."
Moving forward, Mark has some vivid, nightmarish visions of Resyk, particularly the processes involved in breaking down bodies and the ambience of the place as a result. 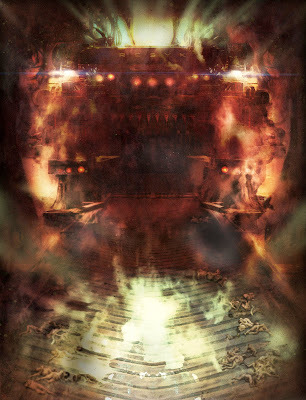 He says "I have it in mind that the basic background has a hellish reddy orange glow, the idea that Resyk is "Hell" and that'll be reinforced with lots of billowing steam rising up, think of the carbon freezing chamber in The Empire Strikes Back." Mark explains "I imagine the conveyor belt being spot lit, patches of dark and light. There's some nice accidentals that sell the "ResykHELL vibe - giving it a broiling billowing steam look of Hades with a demonic face/maw - looking body processor (part garbage truck, wood clipper and meat grinder) at the end of a conveyor belt. Conveyor belt steams for added dynamism; there's steam pumped through drainage holes plus pools of boiling water used to clean the bodies- something I learned from my abattoir ref. I blurred the bodies to suggest heat haze but also to kill the graphicness. There's lots of arterial pipes pumping fluids to other areas for processing. Funnily enough all this references a little know 80's horror film "Razorback" (about a Giant Boar terrorising the Outback,) very hot and humid." 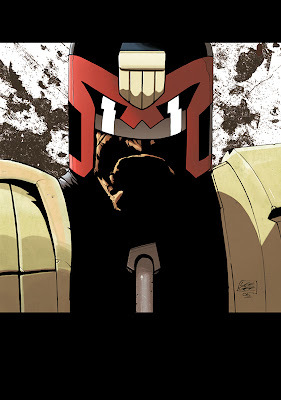 Now to Dredd - "Dredd is in a patch of dark but just passing under a close focus spot of white light that is picking out his head and shoulders in natural colours. The rest fades off in both detail and colours. I felt the image need something more and I don't know if this is the case but I recall resyk uses digestive nozzles to break down the bodies, or they are at least showered in boiling water (I've looked at enough abattoir stuff to know this is the case!) 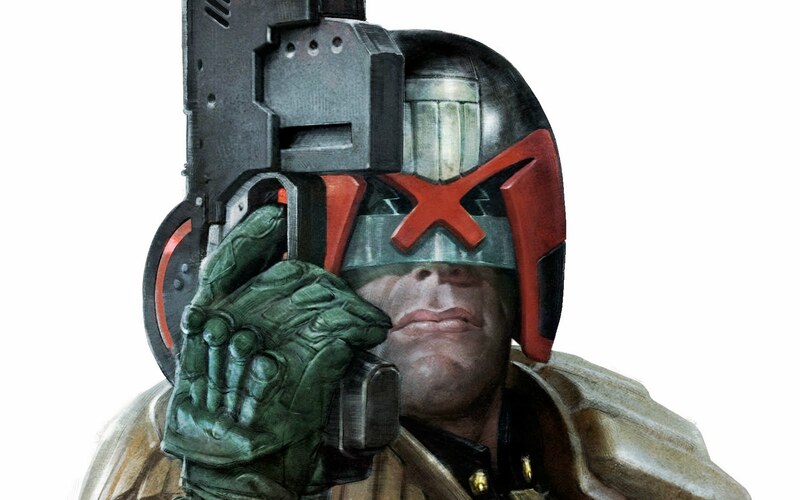 I've imagined the lawman has had a bit of a shower which gives me the excuse for wet streaming Dredd which makes it a little different and dynamic. 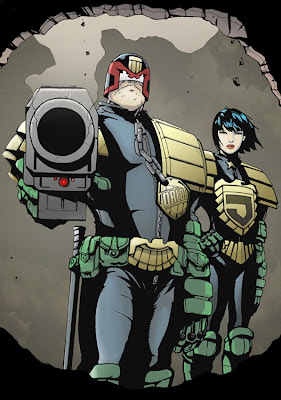 Dredd's got an almost religious look about him too. A Hellish image!" Again, Tharg was pleased with how the cover was going (or as pleased as the migty one gets,) with only a minor quibble, saying "I’m not sure about the ‘wet look’, it doesn’t happen in the story (Dredd just chases the perp into Resyk) and I think it’s just going make the reader wonder why Dredd’s stepped out of the shower. So can we keep him dry?" Mark also had a few colour tweaks for the image too, he said "I found knocking back the green gloved arm into "red light" help focus the attention on Dredd's face, where it should be. See it without and see how it all looks a little too cut out. Resyk was pretty detailed but don't fall in love with the background so I blurred it." 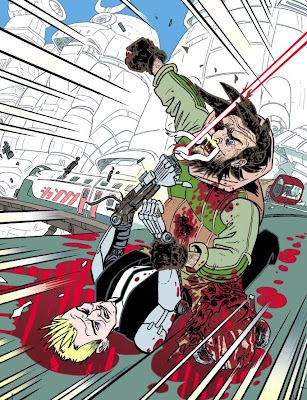 And with that, Tharg was very pleased with the cover. He said says "A very nightmarish version of Resyk. Good pun, too!" For once, I must face the wrath of Tharg and disagree, while the image is excellent, the pun is awful! Almost as bad as mine for this article! Below is a wallpaper which Mark has kindly done for us, including his favourite bit. 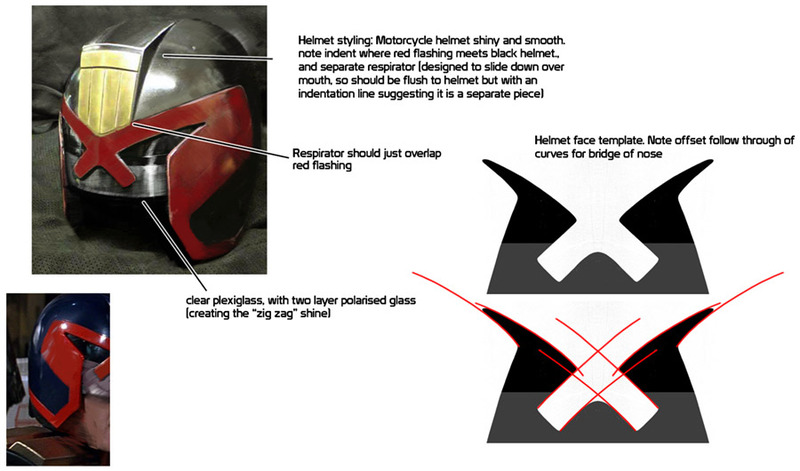 I'll let him explain "My fave bit is the eye you can just see through the visor. Once you see that the expression has more intensity. With: Intense! Without: Passive disdain! That's the problem with a helmeted character (and one the film will have to deal with) you loose a lot of expression without the eyes to convey nuance." 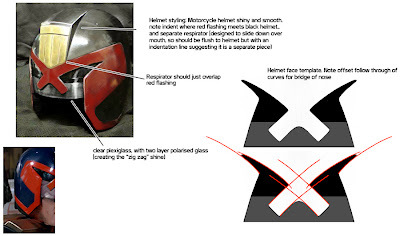 As a further bonus, Mark has included his helmet study. "I've also attached a helmet workout I did to try and figure out the bloody thing..."
Thanks yet again to Mark there for another fascinating walk-through of his creative process. I always look forward to an email form him as they are always jam packed with details and imaginative commentary. Remember, you can see more of Mark's brilliant work here. Clint Langley - Mean Machine! Wow, another wonderful Clint Langley cover for Day of Chaos. What's not to love about Dredd looking mean and moody astride his Lawmaster hunting for perps? If you love this, be sure to check out American Reaper in the Megazine which features brain melting photo-manipulated artwork by Clint and a bonkers script from Pat Mills that is absolutely bursting with amazing ideas - downloadable dresses, neon tattoos, Aeroblasting (kind of reverse bungee jumping to thumping music) and literal identity theft, brilliant! Thanks to Clint for the covers, what a lovely guy! Be sure to check out his website, Facebook page and the Repeat Offenders website, the publishing company he's set up with Pat Mills and Jeremy Davis. If American Reaper (which has already been optioned for a movie) is anything to go by, then you can count me in as a loyal customer! Stak! 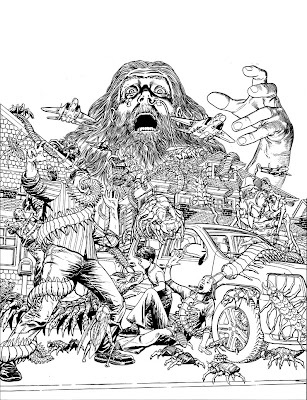 What a brilliant cover to premier fanzine Zarjaz by the superb Staz Johnson! 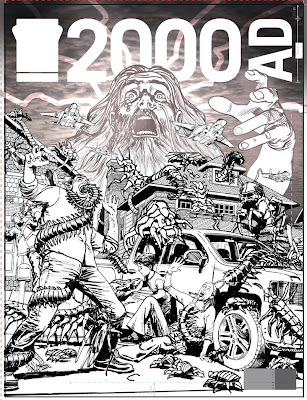 Yes Earthlets, the latest issue of Zarjaz is available to buy from the Quaequam Blog and at the forthcoming Thought Bubble con. 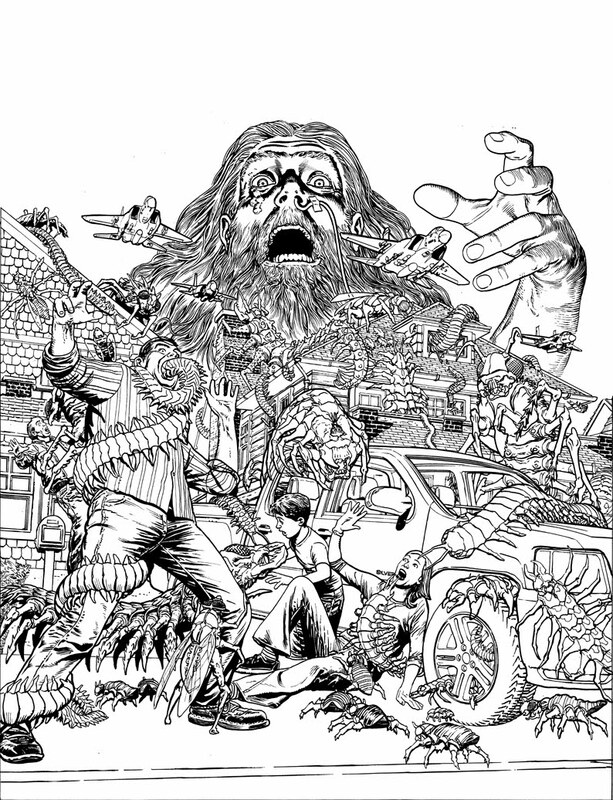 This issue is absolutely packed to the rafters with work from tomorrows' big writers and artists. 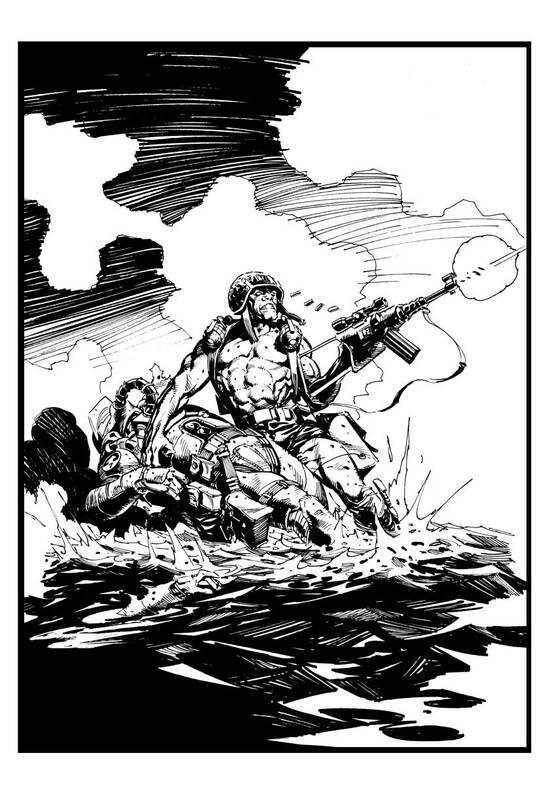 As well as Rogue Trooper, there are tales from Dredd, Robohunter, ABC Warriors, Bad Company and much, much more! Quick, get yerself over to the Quaequam Blog and order a copy or two! 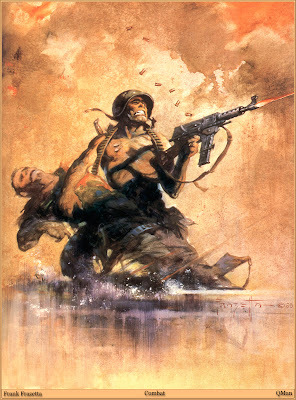 The image is based on the rather familiar looking cover from master artist Frank Frazetta shown below. Frazetta is the inspiration of many, many, many 2000AD artists, please check out this rather amazing Frazetta gallery here, it's stunning. The cover is familiar looking as the original, 46 year old image was used as the inspiration for this classic Glimmer Rats cover by Rebellion concept artist, the fantastic Mark Harrison. Unfortunately, Frazella never directly contributed to the Galaxy's greatest however he did famously paint Dredd busting Alfred E Newman for the cover of Mad Magazine. Thanks to Zarjaz editor Bolt for sending the images. Remember to buy a copy of Zarjaz today!